Meat Loaf has confessed he fell asleep watching the movies nominated for the Best Film Oscar, and hasn't seen them all the way through. The Bat Out Of Hell singer and Fight Club star is a member of the Academy and votes for the award winners. But he admitted he didn't find hotly tipped Best Film contender The Artist easy to watch, so he didn't finish it. 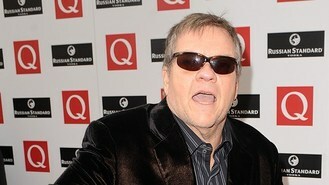 Meat Loaf revealed: "I have a real hard time voting for Best Film, because they're so different. When I get a screener, I watch... we get 60 something screeners this year, I watch 50 of them. "I didn't finish all 50 of them because there were other movies that particularly weren't my cup of tea and I was falling asleep. That's nothing against The Artist." The 64-year-old also revealed he didn't vote in the Best Supporting Actress category this year because it was just too hard to decide. He said: "To be perfectly honest, I don't vote in every category because I think some things just can't be judged, and this year I didn't vote in Supporting Actress because I thought that there was no way I could give one over the other one. "I'm kind of with Viggo Mortensen, (who said) 'You shouldn't have awards for art'. I kind of almost agree with that. "If you were going to have an Oscars you should have it first, before the Golden Globes, before any of the other ones because they're too greatly influencing people who vote for Oscars. I don't know, this is my opinion. They turn around and say: 'Oh, the Golden Globes voted for this, it must be good'. "You can't really judge art, and that goes back to the old saying: 'Eye of the beholder'." Celine Dion has cancelled several upcoming concerts in Las Vegas because of a virus. Tinchy Stryder is apparently hoping to design a line of bikinis. Police are investigating a woman's claim that singer Chris Brown stole her iPhone outside a South Beach nightclub when she tried to take a picture of him. Adam Levine has revealed he would like Sir Paul McCartney to mentor him. Take That's Gary Barlow is teaming up with musical maestro Andrew Lloyd Webber to create a song for the Diamond Jubilee celebrations. Sir Tom Jones is to make his acting debut in a new TV drama. Rolling Stones frontman Mick Jagger has hailed US president Barack Obama's blues singing as "courageous". Veteran chart star Sir Tom Jones is to make his acting debut in a new TV drama.